Ismaili showing the coordinates of the scene. KUCHING: Three local fishermen have been reported missing after the boat they were in collided with an Indonesia Marine Police (Polair) patrol boat following a chase for allegedly encroaching into Indonesian waters on Friday. The three missing have been identified as skipper Ahmad Tarmizi Kipli, 35, Awang Ezam Abdullah Awang Mohammad, 25, and Jamli Saberan, 45. 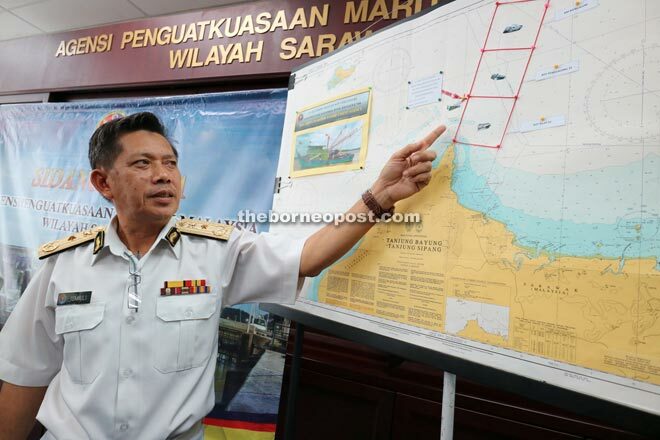 Malaysia Maritime Enforcement Agency (MMEA) Sarawak commander, First Admiral Ismaili Bujang Pit, said there were actually seven people on board the ill-fated vessel, but four were saved by Polair personnel. “All of them are from Beladin, Pusa,” he told reporters at Tun Abang Salahuddin Maritim Complex here yesterday. Ismaili said his office was alerted of the incident by the Indonesian Consulate on Sunday. MMEA, he added, were now scouring an area of 400 square nautical miles in Malaysian waters, off Tanjung Datu, for the missing fishermen. He said the episode unfolded at about 6.45pm, some nine nautical miles off Tanjung Datu on Friday. The fishing vessel, SF1-4655, sank after it was rammed by the Indonesian patrol boat Anra Sena, which had earlier chased the vessel on the high seas. On the joint search and rescue (SAR) operation, he said MMEA Sarawak had deployed 24 personnel. They were also informed by the Indonesian side that Indonesian navy ship KRI Alamah had been sent for the operation. “As of today (yesterday), only four MMEA assets (boat), namely Penyelamat 8, KM Mengalum, Penggalam 33 and Kilat 22, have been deployed to areas near where the incident occurred. Ismaili said it was a first time such an incident had happened.